KANSAS CITY, Kan. — Sister Carol Ann Petersen, foundress of the Keeler Women’s Center here, has a simple philosophy. That, combined with Benedictine hospitality, is the rock-solid foundation on which she built the Keeler Center, with its mission of empowering women through education, advocacy and spiritual development. Recently, when an open house was held in honor of Sister Carol Ann, it was apparent her formula had worked. The center’s halls were overflowing with more than 200 visitors from all walks of life, filled with gratitude for this welcoming place where God works miracles. Sister Carol Ann founded the Keeler Women’s Center in 2003 at the request of the Benedictine Sisters of Mount St. Scholastica, Atchison. She brought to Keeler a firm belief in the power of education, having served 32 years as a teacher and elementary school principal, followed by nine years as associate superintendent of schools. “There’s nothing more important than educating people to help them move out of poverty and to help them have fuller lives,” she said. The open house was a celebration of Sister Carol Ann’s contributions to the center as well as a fond farewell as she takes her formula for success to another venue. She is the new director of the Sophia Spirituality Center in Atchison, another ministry of the Benedictine Sisters. Sister Bridget Dickason is the Keeler Center’s new director, coming to the position with five years experience as assistant director. 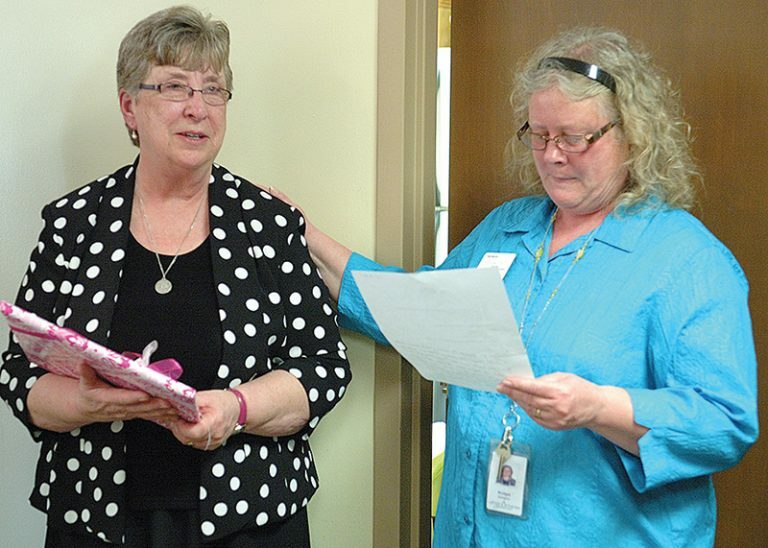 “When Bridget came to Keeler,” said Sister Carol Ann, “it was always with the intent of taking over at some point. And so the open house was a combination of laughter and tears as Sister Bridget bid farewell to her mentor and friend. “We’re so used to her being here,” she said. “She’s such a strong leader. It was difficult on both ends. “I just love Keeler,” said Sister Carol Ann. “I love the women who come and our volunteers. It has been just a wonderful ministry for me. Sister Carol Ann is most proud of her many volunteers, who are the backbone of Keeler’s success. And volunteers are quick to tell you they love being part of the calm, beautiful atmosphere that permeates the Keeler Women’s Center. Sister Carol Ann hopes to take a bit of that spirit with her to Sophia Center. She hopes that with more volunteers the Sophia Center programming can be made available to more people. “I’m hoping we can increase the number of offerings, especially for the rural parishes and young people,” she said. Sister Carol Ann also hopes to network with local agencies. And she plans to tap into the talents of Benedictine oblates. Sister Bridget agreed. With a strong background in theology and spiritual direction, she hopes to make that more of an influence at Keeler. Sister Bridget will have the help of two new assistant directors — Sister Patricia Seipel and Brenda Mortell. “They balance my gifts, or the lack thereof,” she said. “Sister Patricia is a Benedictine and is a great support. Sister Bridget is excited about the future of Keeler Women’s Center. When people ask if she’s overwhelmed by her new duties, she has a pat answer. “I say, it’s not difficult to drive a train that’s already going,” she said. “I’ve just got to keep it on the tracks. I’ve got to keep feeding it fuel. Sister Carol Ann leaves behind a legacy of lives touched by her efforts, and a community bound to continue that legacy. “We’ll do Sister Carol Ann proud,” said Sister Bridget.